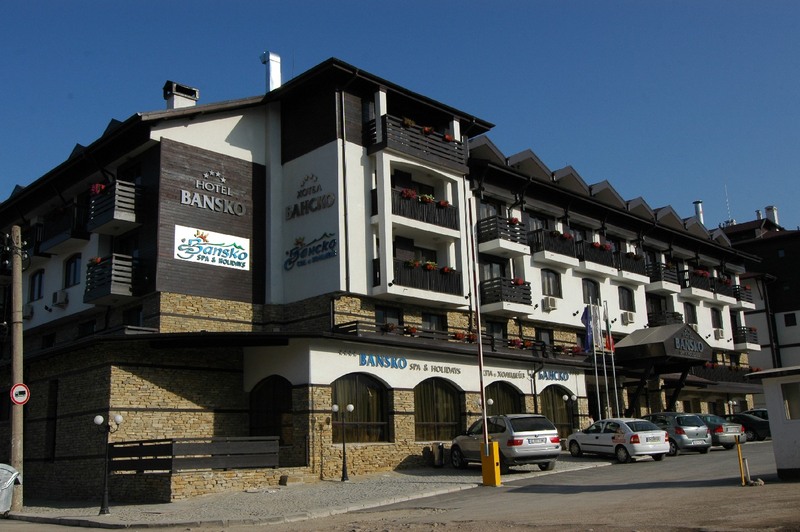 LOCATION: at about 1 km from Gondola lift station and 1 km from the centre of Bansko. HOTEL CAPACITY: 6 apartments (one for the disabled), 5 family rooms, 87 double rooms. HOTEL FACILITIES: tradition Bulgarian restaurant, restaurant, lobby-bar, Royal bar, conference hall, SPA-centre (bathtubs, beauty salon, steam bath, Jacuzzi, sauna, indoor swimming pool, massage, infra-red capsule), children’s room, ski storage, parking, shop and hairdresser, children playground. Suitable for disabled people. ROOMS: 20 m², King size bed, extra sofa, satellite TV, internet access, telephone, air-conditioning, mini-bar, safety deposit box, hairdryer, bathroom with bathtub and WC. ROOMS MANSARD: 15 m², King size bed, without extra sofa, satellite TV, internet access, telephone, air-conditioning, mini-bar, safety deposit box, hairdryer, bathroom with bathtub and WC. The rooms are situated on the last floor/penthouse. FAMILY ROOMS: 25 m², one large room with King size bed, lounge area with big sofa for two people, LCD TV, furnished like standard rooms. FREE OF CHARGE: swimming pool, fitness, steam bath, sauna, Tropical shower, parking, transport to Gondola.